It’s Week 4 of NaNo 2013 and we have a new ML Update from Rick and Val! Yay! I’m (Manda) actually at about 31k right now and woefully behind. Errol’s sister is visiting and she’s awesome so OF COURSE I’m going to hang out with her :D.
Out of the topics we’ve covered in our updates, this is one that admittedly annoys me more than the rest of the issues we’ve brought up. Every year at the end of NaNo, I’ve had at least one or two Wrimos approach me, stars of hope and excitement in their eyes, asking me if I would like to read their novel and they could totally send it to me. The answer is always no now. At first I felt bad for saying no. These people had worked hard, after all. But then I realized that saying “yes” would mean I myself would never get any writing done for all of the first drafts of novels I was reading. And so I say “no” pretty much all the time, usually with a laugh, and they are understanding. Errol was a little less lucky in that someone took it very personally he wasn’t willing to read their novel. Don’t take it personally, guys. We’re all busy folks :D. More importantly, we need rest after NaNo. I am far more interested in drowning my brain in video games after NaNo than seeing even more novels! What sorts of things do you do to recuperate? Happy Week 4 everyone, stay stalwart! Posted by manpans on November 22, 2013 in Web Series and tagged ml updates, nanomusical, nanowrimo, rick, val. And we have another update as Week 3 begins! Poor Errol has been dealing with my freak-outs. We are working on a new project. 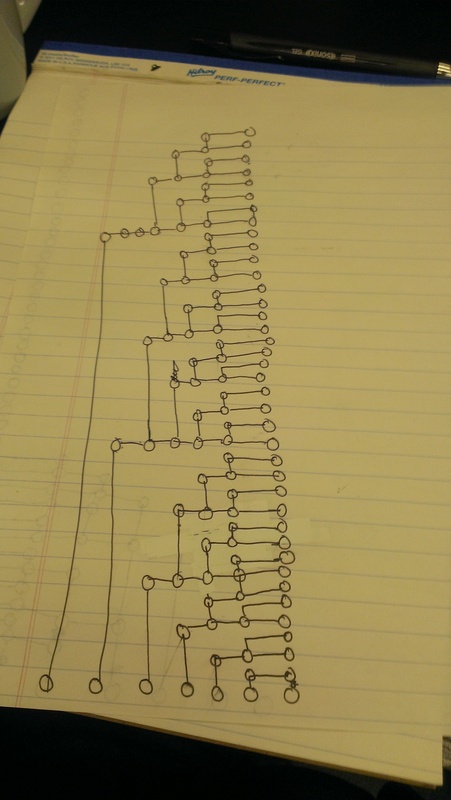 Just to give you an idea of why exactly I’m freaking out, here’s a rough draft of a flow chart. It’s unfinished because the paper wasn’t big enough to finish the chart. Each of the circles on the right represent a possible ending in our time travel game. I am doomed. Posted by manpans on November 15, 2013 in Uncategorized. Posted by manpans on November 8, 2013 in Web Series and tagged ml updates, nanomusical, nanowrimo. Happy November 1st Wrimos! We are pretty excited to be starting NaNoWriMo! This time last year we were putting out the first episode of NaNoMusical. It was scary (well…Manda was scared. Errol was excited) but we couldn’t be happier that we were able to share it with all of you. This year we will be working away on our projects and novels BUT in addition to that we have a surprise! Rick and Val will be giving ML video updates throughout November! You might remember Rick agreeing to be an ML at the end of Episode 6. It’ll be interesting to see how this pans out. Here’s the first update! And it is one that sadly a few veteran wrimos don’t always consider when it comes to overwhelming the newcomers. Of course Rick is more excited about chips than actually giving advice, but that just goes without saying. Enjoy! Posted by manpans on November 1, 2013 in Web Series and tagged nanomusical, nanowrimo.